The new Honda Civic Type-R's lap record is 5.41 seconds faster than the previous record holder, exhibiting the technical expertise of lesser body weight and higher traction. The new Honda Civic Type-R is a pretty tech-laden car to begin with, and to go with its sporty muscles, has set a new fastest lap record on the Nurburgring race track for front-wheel drive cars. The new Civic Type-R clocked lap time of 7 minutes 43.8 seconds, which is a solid 5.41 seconds faster than the previous FWD record holder, the Volkswagen Golf GTI Clubsport S. The Honda Civic Type-R in question is a development model, although Honda states that its power statistics and driving dynamics resemble the production variant. The Type-R is powered by a 2.0-litre turbocharged VTEC diesel engine that produces 320bhp and 400Nm of torque. With the new Type-R, Honda has made simple yet effective use of its front-wheel drive architecture. The 10th generation of the Honda Civic uses a new chassis structure and body that is 16kg lighter than its predecessor. Adding to that is the weight benefit that FWD cars have over RWD (rear-wheel drive) ones. The new structure provides greater rigidity that in turn makes the car faster around corners. Adding to that is a reworked multi-link suspension that makes use of electronic brakeforce distribution to make the car more stable, and the new body shape with swooping aerodynamics and a significantly larger spoiler increased balance for both lift and drag. Other optimisations to the Honda Civic Type-R for this test included removal of the infotainment system and rear seats, and installation of a roll cage to the rear, that Honda states more or less balanced out the body weight in accordance with the production variant. The long wheelbase and wide tyres (specific dimensions are unavailable as of now) also added to the overall stability. Front-wheel drive cars typically put significantly heavy load to the front nose of the car, thereby offering significantly heavier traction up front. However, the overall balance typically takes a hit in comparison to RWD or AWD cars, which offer a more even distribution of weight and power across all wheels. FWD cars, in turn, cut down on transmission and axle link weights required for rear-wheel drivertrain assemblies, thereby making the chassis lighter. 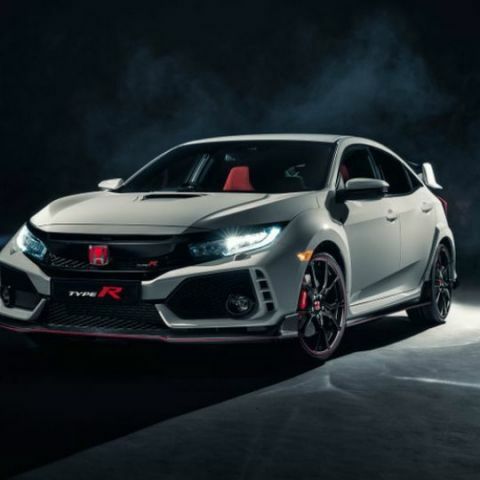 The light weight, coupled with Honda's new rigid chassis and optimised suspension is what has allowed the new Honda Civic Type-R to post the new record. The season is ripe for new car launches, and Honda's latest push is to improve handling and performance of its front-wheel drive performance edition of the iconic Civic lineup. The new Civic is also expected to make a reentry to India, but chances of the new Type-R making it to India are very slim. Production variant of the new Type-R is expected to be unveiled in Q3 2017. Difference between SOC being provided in new mobile phones and the chip-sets provided in earlier phones.? Which is the best navigation device for cars.